I recently purchased some compact film cameras and it got me thinking about how small these cameras are given the size of the 'sensor' in them. People get excited about mirrorless ILCs being so small compared to DSLRs. Or pocketable cameras with 1″ size sensors. And yet film cameras manage to be smaller with larger 'sensors'. 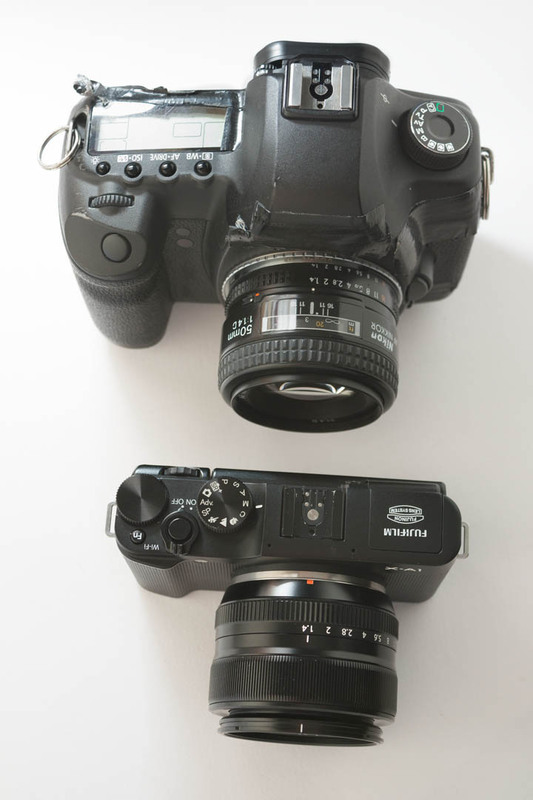 To give an example using my own cameras, let's start with my Fuji X-A1 mirrorless camera, which has an APS-C size sensor, against the full frame Canon 5D mkII DSLR. Here we can see that the mirrorless camera does have a significant size advantage. If we compare the Fuji camera with its kit zoom against a Canon Rebel DSLR with its kit lens, we can see that mirrorless still has quite a big advantage. The lenses are around the same size, but the mirrorless body is a good bit smaller. 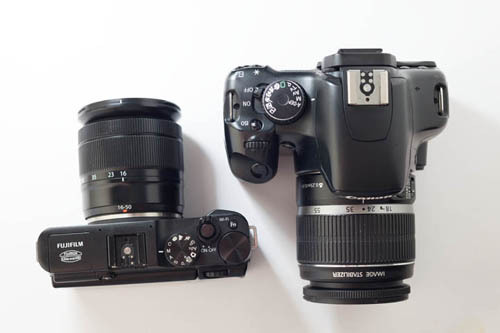 When we start comparing to film SLRs though, the mirrorless camera starts to loose its size advantage. Here is the X-A1 compared to the 'full frame' Olympus OM10. 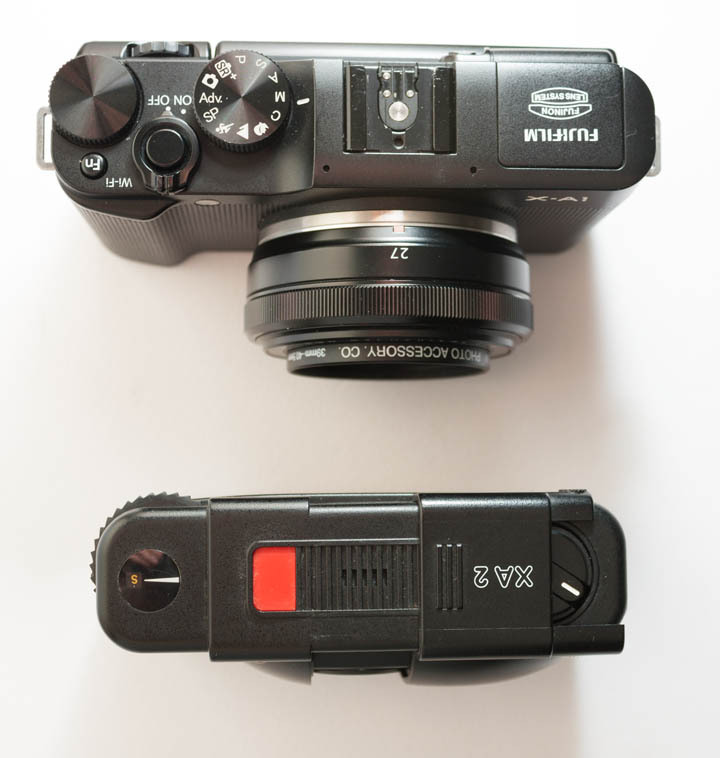 The Oly is a little longer, but much of the body depth is the same as the mirrorless camera. The lens mount area is deeper, but the actual lens is smaller. If you look inside the rear of the Fuji 35mm f/1.4 lens, the rear element is quite far inside the lens. The size of the actual 'lens' part of the Fuji lens appears roughly similar to the Olympus 50mm f/1.8 lens, but the Fuji lens has extra 'extension' on the back to compensate for the smaller flange-back distance of the mirrorless camera. If we compare to a film compact camera, then the digital mirrorless camera really looses out in the size stakes, even when paired with a pancake lens. 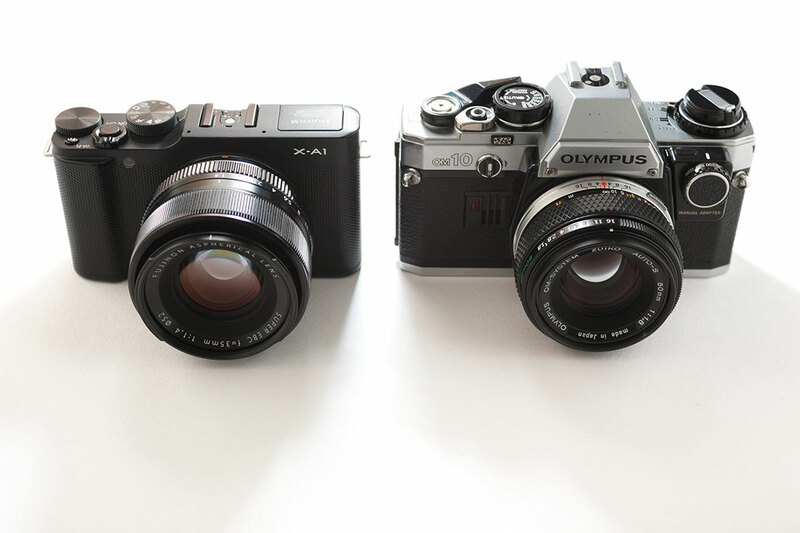 Okay, the Olympus XA 2 I'm comparing to here has a slightly slower lens (35mm f/3.5 on the Olympus vs 27mm f/2.8 on the Fuji). But the Olympus is 'full frame' whereas the Fuji is only APS-C, so in terms of DoF control at least, it's a pretty fair comparison. 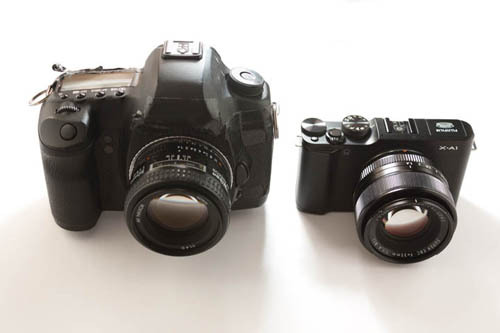 Now, what happens if we compare the Fuji, with its APS-C sized sensor, against an APS film camera? Here I'm comparing against the Canon Ixus Elph, which as you can see is much smaller than the Fuji, despite the larger 'sensor' size of the Canon. (The Canon's 'sensor' is APS-H, a 1.3x crop from full frame compared to the 1.5x crop of APS-C). There are some lens differences again. The Canon has a slow 24mm-48mm f/4.5-6.2 lens. I haven't worked it out, but I would guess this is pretty equivalent (in terms of DoF control) to the Sony RX100 with its faster lens but smaller sensor. The RX100 and Canon Ixus are similar in terms of size too, with the Sony being slightly larger (especially in terms of depth where it is about 10mm fatter). 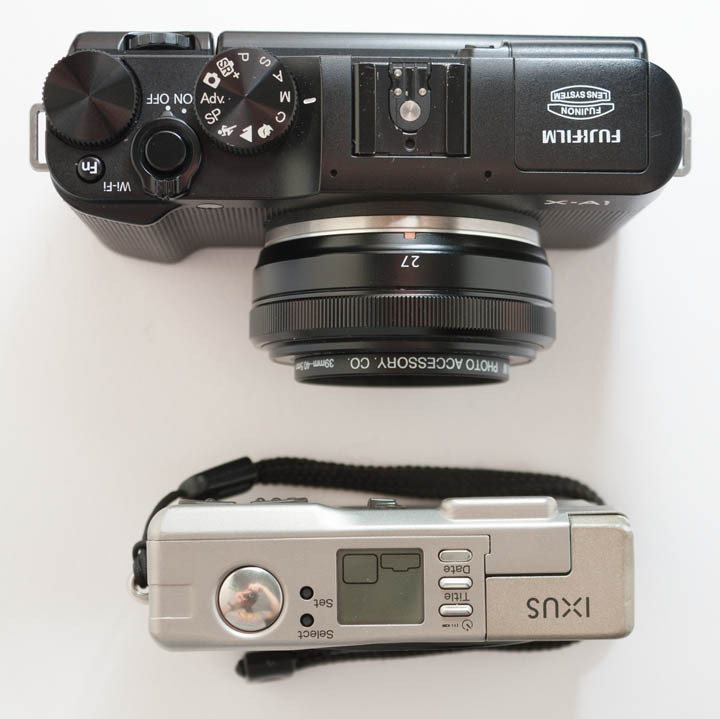 If I compared the Canon Ixus against the Fuji with it's zoom lens, the difference in size would be massive. 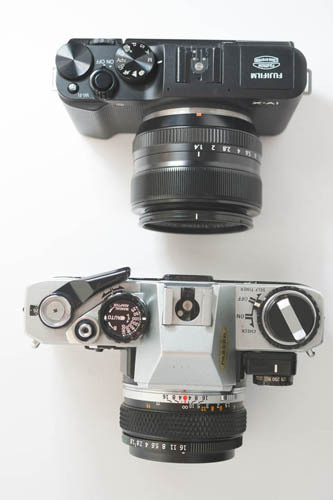 So, why are film cameras so much smaller given their large 'sensor' size compared to most digital cameras? In terms of compact cameras, the answer is that film is much better at dealing with oblique light rays, where the rear of the lens is placed very close to the film plane. For a digital sensor that requires a special design, which I presume is difficult and expensive to implement. In terms of interchangeable lens cameras, there is a big difference in size between many film SLR cameras like the Olympus OM10 and all DSLRs. I'm not sure why this is - it's not due to the mirror. 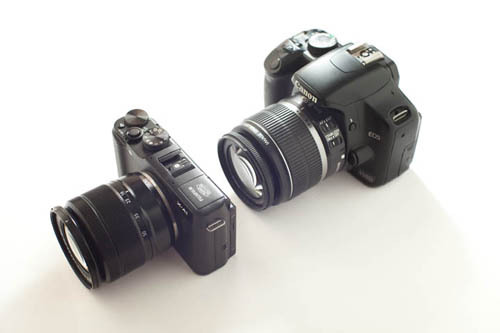 However, mirrorless cameras have greatly reduced this gap. I don't have a Sony A7 camera, but I can't imagine it being much larger than something like the OM10. And of course, you could use it with an OM mount adapter and the nicely sized OM lenses if you wanted. It's worth pointing out that the only thing full frame film offers over a smaller digital sensor is the potential for shallower DoF. There is no low light or image quality advantage. Technology has moved on such that we can now achieve very high quality image quality even at high ISOs on small image sensors. The film compacts I have also offer very little control to the photographer. There's no manual exposure control, and no manual focus. Of course, film SLRs offer full exposure control. But they don't offer a size advantage compared to a mirrorless camera. Maybe in the future we will get compact digital cameras with larger image sensors that can handle lenses very close to the sensor. If any camera manufacturer manages this, I suspect it would make a very popular camera. It wouldn't surprise me too much to see Sony coming out with something along these lines in the years ahead. 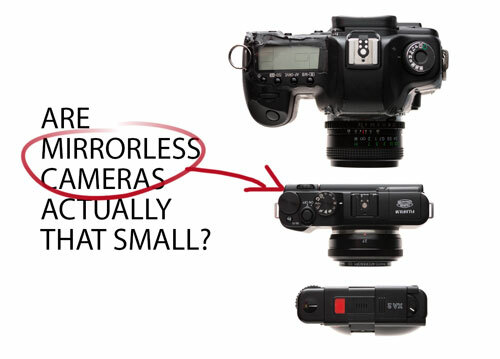 This post: Are mirrorless cameras actually that small?